Beauty rituals may not be the first thing you think about in relation to mental health, but when an American hairdresser told her story about a teenage client with depression, thousands responded. 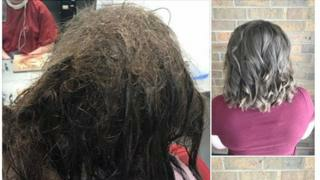 Kayley Olsson, a 20-year-old student hairdresser in Waterloo, Iowa, posted on Facebook on Tuesday about a girl who came into her salon with densely matted and tangled hair. "Today I had one of the hardest experiences - I had a 16-year-girl come in who has been dealing with severe depression for a few years now," Kayley wrote in the post, which has been shared over 55,000 times. The teen had explained to Kayley she "felt so down and so worthless she couldn't even brush her hair, she only got up to use the restroom." The teenager had a school photograph scheduled and she asked the salon to cut off all her hair because she couldn't face the pain of combing out the matted knots and tangles. But Kayley and her colleague Mariah Wenger, who are both beauty therapy students, refused to shear the teen's waist-length hair. "Cutting her hair was absolutely not a option for me. "I knew right then and there that we had to keep as much hair as possible," Kayley told the BBC. "Shaving was a last resort and something none of us going in wanted to do," Mariah added. Emma Watson's appeal to find her 'most special possession'. The women untangled and combed the teenager's hair for 10 hours, spending two days with her. "It took a lot of encouraging words, reassurance, and just plain conversation to take her mind off of the pain involved in removing the matting and to boost her self esteem and confidence. "I was able to very closely relate to her mental health problems and the daily struggle that comes with them, due to my struggles with postpartum depression and anxiety," explained Mariah, who has two children. "I understood how it felt to feel worthless - a child should never feel like that. "I knew I had to help her, just like people helped me. We all deserve to feel beautiful," Kayley said. After detangling it as far as shoulder height, Kayley and Mariah cut and shaped the teenager's hair. "Let's just say we both let out tears of joy! "Her last words to me were, 'I will actually smile for my schools pictures today, you made me feel like me again,'" Kayley explained. The post has received nearly 60,000 comments (at time of writing), including women relating their own experiences of mental health problems. "It's happened to me - I suffer with bipolar and had an episode and didn't brush my hair or take care of myself - just remember beautiful girl you're not on your own," wrote Sarah-Lee on Facebook. "I work with mental health and good for you. I see this daily it's sad but so true," said Renay St Amand. "I've been in this position and I can't tell you how comforting and important it is for a hairdresser to be kind and understanding. I wasn't judged either and got my hair back to being beautiful," wrote Claire McDonald. "I have been struggling with my depression and suicidal thoughts. It's hard to even get out of bed but I try to fight everything negative. Plus you are beautiful and you are worth something I promise," another woman posted. "I'm so glad there are people out there who understand mental illness... So a big thank you to you for putting your whole heart into this lil lady," wrote Angelbear Read. Others described how beauty and grooming can be important to people experiencing depression. "You are awesome to recognize this as a mental issue and also for giving her back her dignity by fixing her hair issues," wrote Patricia Barron-Gondeiro.